Submitted by mad on Fri, 2018-12-14 09:57. Submitted by AdvisoryLemon on Thu, 2018-12-13 08:16. Having an error within 3DS Max 2019. Submitted by arodrigues on Thu, 2018-12-13 03:42. Submitted by marcusrodriguez on Wed, 2015-04-01 04:46. Submitted by marche on Tue, 2014-08-05 14:33. Submitted by breakneck001 on Sun, 2014-06-22 00:10. When i select the object and then clock on your interface, eg- i select body and select body on the scrip it says error select car body! Submitted by kandee.arrow on Thu, 2013-03-14 07:36. I've done the all setup as per PRE-REQUIREMENTS process. Finally when im clicking the rig button and its showing "This script doesn't support yours system units. Speed will be wrong!" Then once im clicking the OK button and its processing after that im getting below error msg. "UNKNOWN ERROR : -- Incompatible types: 130.665, and undefined"
Please let me know what was the mistake i did and what is the solution. How can i select the terrain object. Submitted by salihelci on Mon, 2012-12-24 08:58. Submitted by spirobg on Wed, 2012-10-10 09:24. 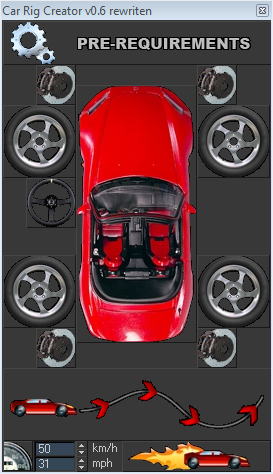 I've tried the script on max 2012 x64 but it doesn't work it mess up the tyres and the body of the car at first i was trying with high quality model and then make a very simple model and i doesn't working again.... no errors just doesn't working i am sure for the linking part its not my bed..but good idea i hope i. managed it. Submitted by jos on Wed, 2012-10-03 02:50. Simple, fast -> Well done. I've created my car rig in no time.